There is a lot of country out there. 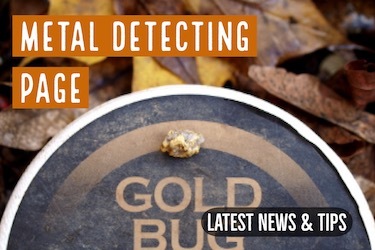 You could swing your metal detector of months before you come across a gold nugget. Sampling helps you narrow down your search area, and will increase your odds of success. Don’t just wander around blindly through the desert. I primarily metal detect for gold nuggets. 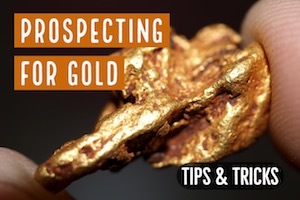 It is my favorite prospecting methods and it has worked well for me in several states. I have tried pretty much everything to find gold (panning, sluicing, highbanking, etc. ), I enjoy metal detecting the most. So Why do I use a Gold Pan? If I am metal detecting for gold nuggets, you might find it strange that I recommend that every detectorist carry along a gold pan , and use it frequently. Now I’m not telling you to spend hours along the creek panning for specks. 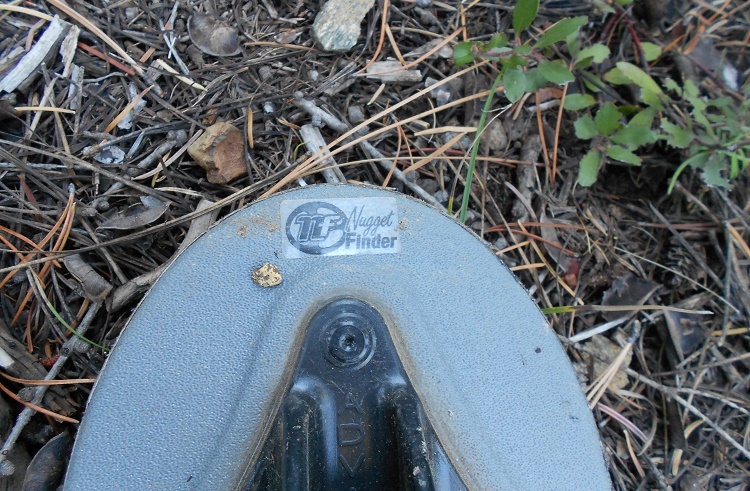 The gold pan is a tool I use to locate sources of gold, not as my primary recovery tool. Not everywhere I hunt for gold is a known mining area. If I am in a place that I know there is gold, then by all means, just start detecting. No need to sample because I already know that gold is present in the area. However, if I am in a place that I am not sure if there is gold, I’d rather do some sampling with my pan to help determine if I should spend my time there. Finding some gold – ANY GOLD – tells me that there is some gold in the area. I’m not trying to hit the “Mother Lode” here; I just want to know that there is some gold around. So let’s say that I am in some remote desert wash somewhere in northern Nevada. 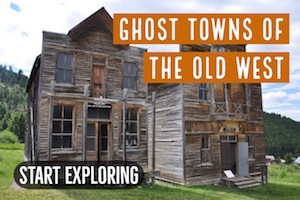 There is a known goldfield a few miles away, but that spot has been hammered over the years and I am looking for an undiscovered patch. So I get out the gold pan . I’ll find a low spot in the drainage and dig down to bedrock. I don’t care if there is water there or not. If I’m in Nevada, then there probably isn’t. I will dig down and get some good panning material, digging down into those cracks and getting some nice material where gold should be hiding. Now obviously I always bring plenty of water with me when I’m out in the desert, but I will bring an extra cube of water just so that I can do some panning without using my drinking water. What Do I Find Out by Sampling? Clearly, I want to find a little bit of gold. The presence of gold, even if its just some tiny specks, tells me that there is auriferous minerals in the vicinity, and it’s worth spending some extra time looking with my detector. On the other hand, if I don’t find any color after testing a few sample pans, I will probably move onward and try the next drainage. Now in a place like Nevada (or anywhere in the desert)there are countless little drainages and gulleys to prospect, so you don’t need to go far. I’ll keep sampling until I find some gold, or see some evidence like old dig holes or drywasher tailings that indicate the potential of gold in the area. This nugget came from an area that would be easy to overlook. The area had seem placer mined a bit back in the 1860’s, but overgrowth and pine duff covered any sign of the old diggings. A little color in the creek below encouraged me to hunt some of the exposed hills nearby and I’m glad I did! Does Fine Gold Guarantee a Nugget? Finding small gold doesn’t mean that there are gold nuggets present, but it does increase the odds. This is particularly true if you are in a place where it is generally known that gold nuggets exist. Of course, finding no gold also doesn’t mean that there aren’t any nuggets. Sometimes nuggets occur in places where there is very little fine gold. However, I have found this to be an exception rather than the rule. 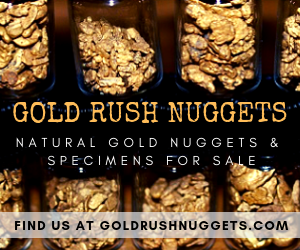 Generally I can find some fine gold in areas where to there are nuggets. But that fine gold doesn’t guarantee a gold nugget is in the area. This sampling method will work anywhere. 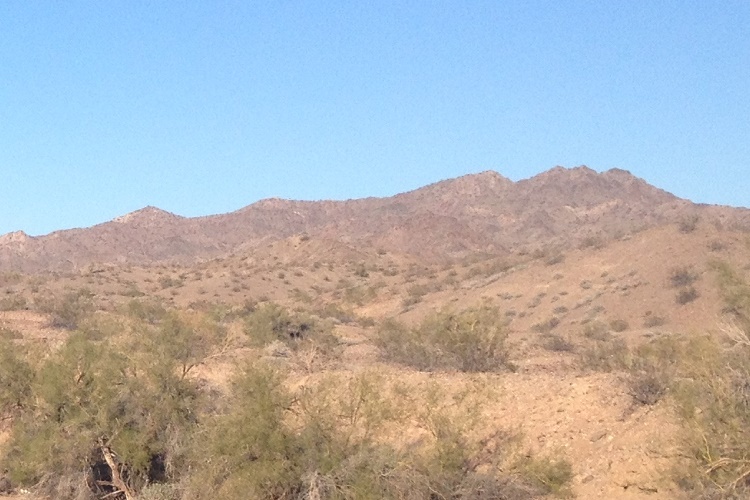 The place that it has really paid off for me though is in the desert, in areas that don’t have any water. Other prospectors are quick to pull out their gold pan when there is a flowing stream, but is seems like very few of them bother to pack along extra water and search in dry areas. I used Northern Nevada as an example in this article, but you can of course use this method anywhere. I have successfully used it in Arizona, Nevada, California, Oregon, and Idaho to find sources of gold that other prospectors have missed. It’s a simple idea. 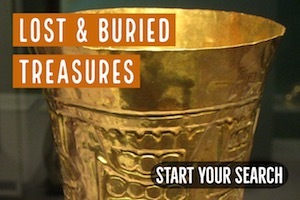 Put it into practice and you might just increase the amount of gold that you find with your metal detector. You will spend less time swinging your detector over barren ground, and increase your gold finds by only searching in areas that you know there is gold. 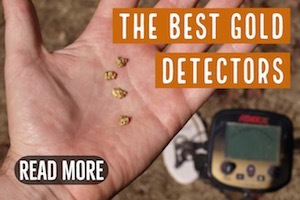 Another thing that will increase your odds of finding a nugget once you have found some fine gold, is to use a sensitive detector like the Fisher Gold Bug 2 or the new Minelab GOLD MONSTER 1000 . These detectors can find really small gold, those little “pickers” and “crumbs” are a lot more common than the bigger nuggets. Once you pick up a few smaller nuggets, then you might decide that it’s worthwhile to try a good quality Pulse Induction metal detector . These aren’t quite as sensitive to small gold, but they are way better at punching deep on larger nuggets. Most of the pros now use Pulse Induction metal detectors. Give this method a try. I think you will find that it increases the number of gold nuggets that you add to your poke next season.